Versipack was originally designed for Search and Rescue work, the S-type allows for the additional attachment of the CP-L Radio Holster (#0102) or any other MAXPEDITION accessory pocket in place of the cellphone pocket on the standard Fatboy. In addition, it rides on the left side of the body filling the need for a 'lefty' Fatboy and a grab-and-go gear bag that does not hinder the quick drawing of a sidearm on the right hip. NTOA TESTED & RECOMMENDED. Better For Left Side Carry. Concealed Carry Bag. Also available in digital foliage is the 0403DFC which is the right-side carry model with the same dimensions as the 0408. The Maxpedition Fatboy Versipack is more than a durable, ergonomic shoulder sling pack; it is the state-of-the-art portable gear organizer that provides secured containment for and rapid accessibility of daily equipment. The versatile main compartment has a huge 156 cu. in. of space with a water-resistant storm collar that can be deployed by pulling a cord-locked drawstring. 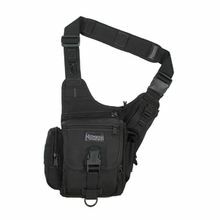 An array of integral fixed-position external pouches retains and indexes individual pieces of gear while two sets of nylon webbing anchors accommodate MAXPEDITION's modular expansion accessories such as the CP-L Radio Holster. It also has a 2" wide Velcro loop patch on the front lid for attachment of ID patches. Each Fatboy comes with a tactile non-slip shoulder pad providing great comfort during extended use. The Fatboy's rear slip compartment is now equipped with large loop Velcro patches to accommodate our Hook & Loop Modular Accessories (e.g. #3501 Universal Modular Holster, sold separately). This allows the user to position their concealed carry firearm for a quick strong side draw or weak side cross draw. Main: 8" x 6.5" x 3"
Frontal: 7" x 5" x 1.5"
SideA: 6" x 3" x 1.5"
SideB: 5" x 1.5" x 1"
SideC: 4" x 2.5" x 1"
Shoulder : Integral 2" strap (min 40" / max 60") with 2" non-slip shoulder pad.